This is so cool! I have just the odd-sized, shaped and water-themed postcard I’m going to send! I’ll send you a link to my blog when I post my recent cards. Thanks for the tip! This brings an interesting brings question to mind. 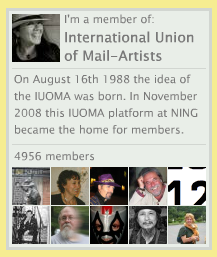 My mother, who passed nearly 40 years ago, was a writer, an active member of several international Pen Pal groups. One of her steady contacts was a school teacher whose address was hardly more than Atlantic Ocean, as I recall. While purchasing postage her postal clerk assured her there was no such address. She stood her ground and assured him that someone would be grateful for the letter. Several weeks later a response arrived from the teacher. My mother returned to the post office and educated the clerk. The group had a new subject that had probably been a source of interest before. And thanks for your little nugget of a story!